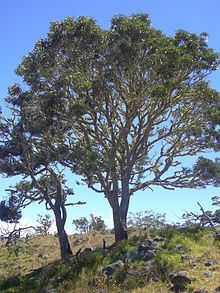 Acacia koa, a species of large tree in the family Fabaceae which is endemic to and common on the islands of Hawaii; or the wood of this tree. As you get higher, native vegetation takes over, so a prospect might be framed by the dangling leaves of the beautiful koa tree, each leaf a gently curved, trembling sickle. The outer frame is made of koa and maple. At her funeral, Likelike's body was placed in a polished koa coffin, adorned with sprays of gardenia […]. From Proto-Polynesian *toa (compare Maori toa), from Proto-Oceanic *toRas, from Proto-Malayo-Polynesian *teRas (compare Indonesian teras (“heart, pith (of wood)”)). From Proto-Polynesian *toqa (compare Maori toa (“brave”)).